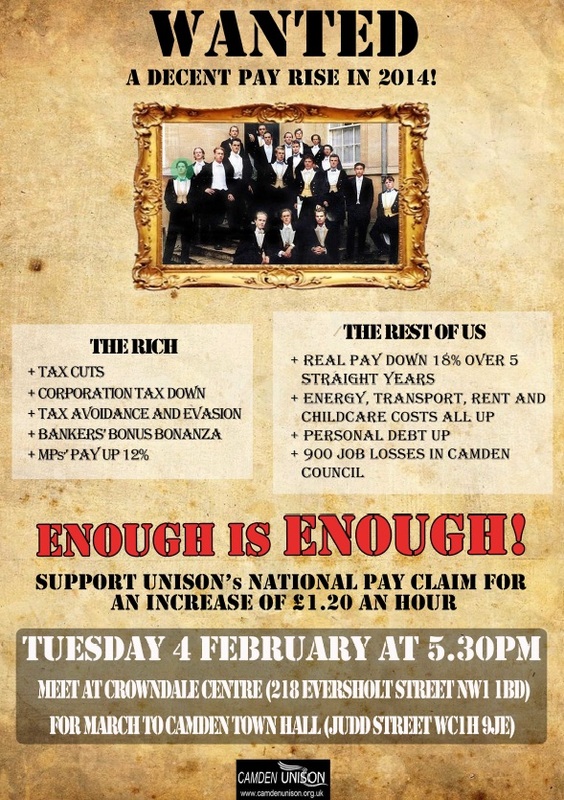 Camden UNISON with the backing of Camden Trades Council has called a demo from 5.30 PM on Tuesday 4 February, beginning at the Crowndale Centre, 218 Eversholt Street, NW1 1BD, as part of a national day of action in support of the union local government pay claim of a rise of £1.20 per hour. We have organised the demonstration with the aim of engaging of other UNISON branches, not least in Higher Education, to join in a call for a long overdue real pay rise after five years that have seen the typical value of real wages fall by 18% even as tens of thousands of jobs in local authorities have disappeared. Through Camden Trades Council we’re also seeking to reach out to other public sector unions with the aim of making the evening a more generalised protest against austerity with George Osborne making plain that the Coalition would be demanding an additional £25bn in spending cuts over and above those previously announced. Local FBU members have already indicated they will be joining in and Camden teachers look likely to be part of the protest too. By coincidence our local march coincides with the first day of a 48-hour strike by the RMT and quite possibly the TSSA over ticket office closures across the whole of the Tube network and some 950 job losses on London Underground. This entry was posted in Uncategorized and tagged demonstrations, LB Camden, NJC, pay. Bookmark the permalink.